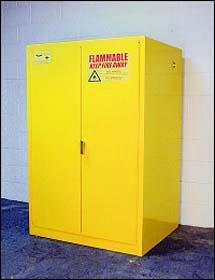 Storage cabinets constructed of 18-gauge steel with a caution yellow powder-coat finish with “FLAMMABLE–KEEP FIRE AWAY” in red lettering on the front. Cabinets with self-closing doors are equipped with a fusible link that automatically closes the door if the link melts due to fire. Polyethylene tray kit 56610-420 fits 113.6L (30gal.) and 170.3L (45gal.) models and includes two shelf liners and one bottom tray, all capable of holding up to 3.8L (1gal). The sides, top, bottom and doors are double-walled with 3.8cm (11/2") air space between walls. Vents have 5cm (2") pipe-thread fittings and are equipped with a fire baffle and cap. Cabinets are equipped with grounding attachments, three-point key lock on doors, 5cm (2") raised, leakproof door sills, and four leveling feet. Each adjustable shelf is supported by four brackets. 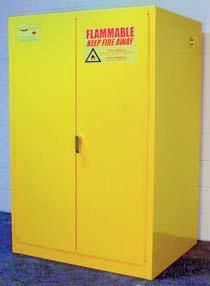 Certifications: Conform to OSHA flammable liquid storage requirements and NFPA Code 30. Models with a capacity of 113.6L (30gal.) to 227.1L (60gal.) are FM approved.